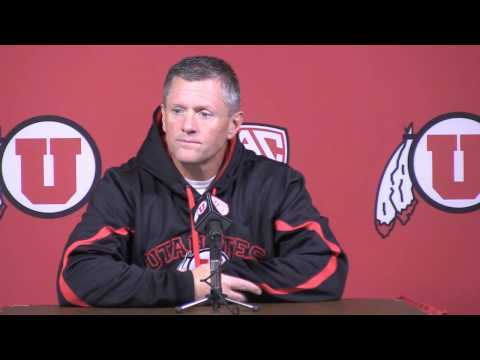 SALT LAKE CITY — Utah coach Kyle Whittingham offered a blunt assessment of Saturday’s 19-3 loss at USC. The offense, though, received a far less flattering review. “It was a collective effort and not a very good one overall,” said Whittingham, who noted that there weren’t a lot of positives other than the team playing hard. The Utes managed just 201 yards and 13 first downs while surrendering six sacks and turning the ball over four times (three interceptions, one fumble). Starting quarterback Travis Wilson, who played with a protective glove over his banged-up throwing hand, was especially ineffective. The sophomore completed 5 of 14 passes for 51 yards, throwing two picks and fumbling the ball away while being sacked. He wound up sharing time with backup Adam Schulz, who also struggled. Wilson declined to use his injured hand as an excuse. At Monday’s press conference at the Spence and Cleone Eccles Football Center, Wilson’s injuries appeared to be on the mend. His battered and bruised hand was even free of bandages as the Utes (4-4, 1-4) embark on a bye week before playing host to Arizona State on Nov. 9. As for his confidence, Wilson plans to get healthy in that regard as well. The Utes will practice through Thursday this week before getting the weekend off. NOT THE ONLY ONES: Like Utah, TCU is finding the jump from the Mountain West to a BCS conference a bit difficult. The Horned Frogs, who made the move to the Big 12 in 2012, are 3-5 this season. Whittingham isn’t surprised by the challenges both teams have faced in the transition. He said there’s a “catch-up phase” when going from non-BCS to BCS with the core of the teams needing to continually improve. “They’re just going through some of the same growing pains that we are in my estimation,” Whittingham said. REILLY HONORED: Senior captain Trevor Reilly, who leads the Utes with 69 tackles, 11 tackles for loss, five sacks and three fumble recoveries, is one of 12 national semifinalists for the Butkus Award (best college linebacker). Reilly is joined as a Butkus Award semifinalist by Anthony Barr (UCLA), Lamin Barrow (LSU), Chris Borland (Wisconsin), Khairi Fortt (California), Khalil Mack (Buffalo), C.J. Mosley (Alabama), Denzel Perryman (Miami), Ryan Shazier (Ohio State), Shyane Skov (Stanford), Yawin Smallwood (Connecticut) and Kyle Van Noy (BYU). MANNING PLANNING: Despite the fact that the offense struggle against USC, Whittingham said there was never really any serious consideration to replace quarterbacks Wilson and Schulz with planned redshirt Conner Manning. Whittingham, who noted that the true freshman may not be ready for such a situation, said it’s just not a viable option. “In fairness to Conner and thinking objectively what that would bring to the table for us right now — in our situation — we don’t think it’s a smart move at this point and time,” Whittingham explained. EXTRA POINTS: Utah’s Nov. 9 home game against Arizona State will kick off at 2 p.m. It’ll be broadcast on the Pac-12 Networks. ... The Utes top the Pac-12 in fewest fumbles lost (two), net punting (39.3 yards) and sacks (27). Individual leaders include Tom Hackett (43.1 yards per punt) and Dres Anderson (19.5 yards per reception). ... Bleacher and standing-room-only tickets are still available for Utah’s remaining home games against Arizona State and Colorado. ... Starting offensive linemen Siaosi Aiono, Vyncent Jones, Jeremiah Poutasi, Jeremiah Tofaeono and Junior Salt have played every snap for the past six games.